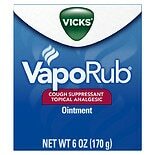 Relieve a cough and minor aches by using Vick's VapoRub. 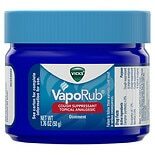 Keeping a jar of VapoRub handy can help you breathe easier whenever you need it. 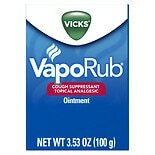 Apply this topical ointment directly to the chest so that you or your children inhale the vapors. And you don't have to worry about side effects or interactions with medications, since it's not a medicine. 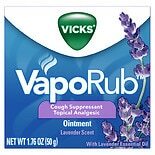 Here at Walgreens.com, we carry various jar sizes and scents of Vick's VapoRub. 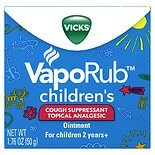 Although it's well known for cough and cold relief, you can also use Vick's VapoRub directly on areas that are sore and achy. Whether your pain is caused by the common cold or flu or not, VapoRub ointment can help relieve minor joint pain and muscle pain. You also have the choice between the original menthol scent and lemon VapoRub. 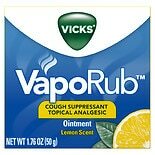 Vick's also offers other medicines and treatments for cough, cold and flu. You can find cough relief liquids for both day and night time relief, and there are soothing cough drops you can take with you on the go. Thermometers and mediscopes can help you keep track of your and your family's health. To make breathing easier and more comfortable, browse Vick's vaporizers and humidifiers as well as medication for use with these devices.